Along with many of us who grew up in the 60s and 70s, Gary first remembers listening to his parents’ Frank Sinatra records around the age of three. Most notably, the Christmas album and Sinatra at the Sands, which included such greats as Come Fly with Me, I’ve Got A Crush On You and Fly Me To The Moon. Back in the late 80s, while hanging out in local clubs, Gary’s interest in music & entertainment began to grow. He started out by hosting Karaoke at Lido’s on the Lake in 1991, and over the next nine years developed his own act while playing various venues and functions. Things started to really pick up in 2003. 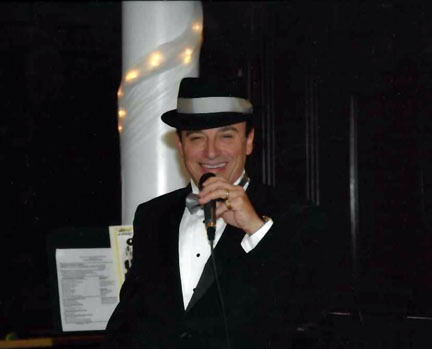 In January and through the summer, Gary appeared at Andiamo’s Osteria in Rochester and, from September 2003 through March 2004, he played at Rosebud’s in Shelby Township. Since then he has appeared at a number of venues around town, including Guiliano’s in Chesterfield Township, Gino’s Surf on Jefferson Avenue in Harrison Township, Andiamo’s, both in Warren and St. Clair Shores, Petruzzello’s in Troy, and Jack’s Waterfront Restaurant in St. Clair Shores. Gary has also performed in theatre, playing Henry Ford in the jazz opera Murder at the Ford Rouge, at the Macomb Performing Arts Theatre in March 2010. Gary also works with Sam Solomon’s Legends Live, doing tribute shows, and Kathy Krajewski’s Double Exposure, both of which provide opportunities to network with other local acts. In addition, Gary also has a Frank Sinatra and Dean Martin act with friend Steve London, and has performed with Jerry Connelly (Gene Pitney/Buddy Holly), Danny (DannyD) Dzialo (Rod Stewart) and Barry Allen of Barry Allen Presents. Gary did great! Everyone thoroughly enjoyed him!